Editorial comment by Liz Crowe: Here at St Emlyn’s we are committed to developing and leading the way in terms of staff wellbeing. If self-reflection and self-awareness are two essential elements in building wellbeing, then we are proud to bring you this thought provoking guest blog from Stevan on the concept of co-dependency. Some of you may find this blog controversial and/or challenging. Within the St Emlyn’s team, it caused great debate about whether we should publish it. Could it be that at times we enjoy the secondary gain of suffering? We are interested as always in your thoughts. We think Stevan is well placed to write this piece as he has a varied work career which up until recently included working in South Africa where the challenges on resources and people extend beyond the Emergency Department and make many of our own work environments look luxurious. As always, we encourage your feedback and thoughts. Disclaimer: this blogpost does not apply to everyone, but it does apply to a many of you (even if you choose to disregard it). I am not a psychologist and do not pretend to be one. But I am a recovering codependent and I’d like to share with you what I have learned about codependency, emergency care and life. We all know that feeling. Sometimes it starts during your shift, at times it creeps up on you on the way home, and at other times it wells up uninvited, just before your shift starts. It overwhelms you, consumes you. Sometimes slowly, sometimes rapidly and brutally. Sometimes it doesn’t let go. It is uncomfortable enough to make you want to pull away, run away. But you cannot. It is too busy now; stretchers out the door (again). Why can’t they just get rid of that idiot? You need to focus. People, patients, your colleagues, everyone depend on you. It feels too much to bear, but you must. And tomorrow, you do it all over again (if only you could get some sleep). You used to love your job. Now you secretly (or not so secretly) resent it. But you don’t really have a choice… or do you? Codependency literally means to share a dependency, without partaking in the actual dependency, alongside a person (or situation) that is caught up in some form of dependency of their own (alcohol, money, targets, workload, etc.) whom as a result of your shared (or co-) dependency has now also become dependent on you. It is a negative relationship, hard to recognise and difficult to escape. Codependency was first described by Melody Beattie in her book Codependent no more 1 back in the eighties. Melody started off as an alcoholic, then sobered up and became entangled (as a recovered alcoholic) in a number of relationships with alcoholics, before recognising her codependency and writing this excellent book. Of course the majority of us are not alcoholics. And thankfully her book is not aimed at alcoholics. It is aimed at codependents. You know, those of us (who am I kidding, most of us) hanging on for dear life to some or other destructive relationship(s) – even if we are intensely unhappy with the status quo. My twitter-feed is filled with examples broadcasting codependency, especially within the emergency care community*. I am certain most of you have either seen or sent tweets like these. 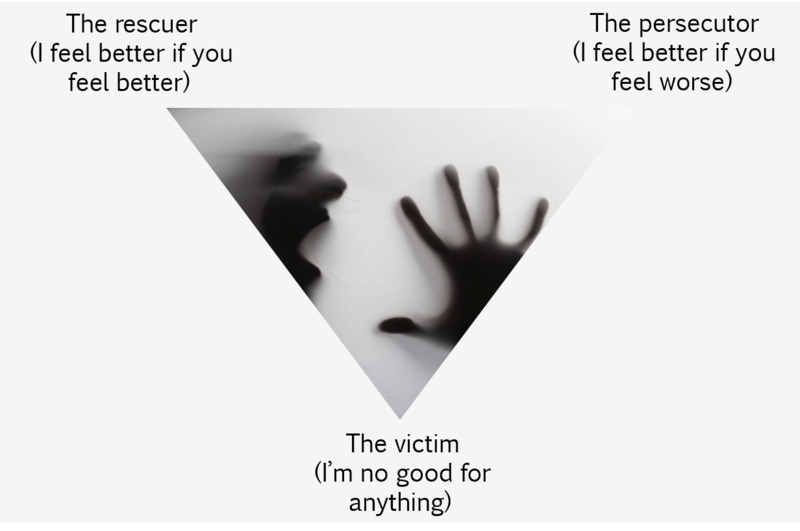 Tweets that describe uncomfortable personal situations or interactions in the workplace tend to follow three distinct personas: the victim (“why me?”), the rescuer (“I saved the day”) and the persecutor (“not like that, idiot”). Sometimes a single tweeter would draw from multiple personas at different times. However, in general most prefers one of the three personas. Often this is the victim, but I’ll come back to why. These three personas were described nearly 50 years ago by Stephen Karpman2. Karpman arranged the three in an upside down triangle and referred to it as the drama triangle. Not because of the inevitable drama associated with it, but rather because he saw these as roles that are acted out in a conflict situation; like actors on a stage. When faced with conflict, we choose to act the role of a victim, a rescuer, or a persecutor (just like in soap operas). Karpman’s work has become poignant in both structural analysis (how we define roles in a conflict) and transactional analysis (how we switch between roles in a conflict). Now the way Karpman arranged the roles on the triangle is also important. He placed the rescuer and the persecutor at the top, and the victim at the bottom. See, Karpman recognised that even where a person reacts to conflict in the rescuer or persecutor role, they will eventually end up as the victim if conflict persists. In a way, even the rescuer and persecutor roles are essentially victim roles. It is simply three different, but connected ways of reacting negatively to conflict, that robs us from who we can be. Starting to sound a bit familiar? So what has the drama triangle to do with codependency? It is inevitable that each of us, at some point, will engage with the triangle when faced with a sustained stressful relationship or situation. Like codependency for instance. Consider this: is it really just busy when you come to work, or is it simply always busy? Will a shop floor that has gone to the dogs really go to the dogs even more if you go home on time, take a deserved break or stay at home when ill? Will calmness really be restored after you’ve sorted out those incompetent GPs, specialty teams and duty managers? Most likely not. And yet we still choose to act these roles. Essentially we become codependent to the service we provide. We cannot let go. It needs us; or so we tell ourselves. Even though it frequently affects every other part of our lives so negatively: our relationships, our families, our health, ourselves. 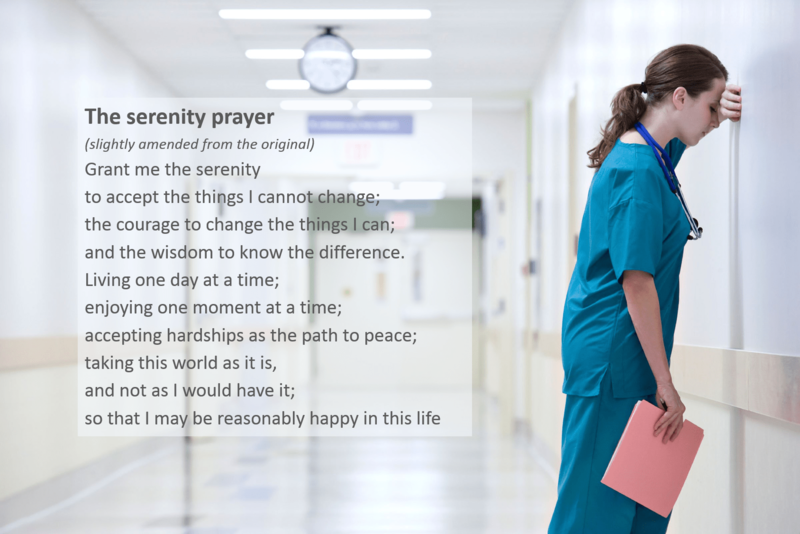 It is probably one of the big reasons we struggle to be kind to one another, create silos and consider getting out of emergency care – even if our co-workers think we are amazing for “always being there”. Codependency is not a nice place to be. Moving on from codependency is very, very difficult. The first step to solving any problem is admitting there is one. But it is not in a codependent’s nature to admit to being the one with the problem. Many of us have become such good codependent actors, that we cannot differentiate role from reality anymore: “Surely the problem must lie with the dependent person or service?” It doesn’t. The short explanation is that we are not responsible for the dependency of another person or service, we are only responsible for ourselves. Neurons that fire together, wire together; if we live a lie for long enough, it inevitably becomes our reality (even though it doesn’t become the truth). Escaping codependency is actually fairly simple once you have acknowledged its presence. It simply requires you to break your preferred acquired conflict pattern (the victim, rescuer or persecutor) and instead replace it with the more grounded role of the survivor, coach or challenger. In other words moving away from the actor you and towards the true you. From making time to care for others to making time to care for you. Inability to achieve this sadly means that you’ll just take your conflict act with you wherever you go. It is a bright and glorious day, the day you realise that the most important place from which to engage with any relationship is from within. Only outside of codependency can we be awesome healthcare providers, whilst also becoming healthier in other aspects of our life. Despite working in some of the most challenging healthcare environments. If this blog post interests you, I would recommend reading Melody Beattie’s book on codependency. Then start your journey from there. Two other great books are: The Power of Ted: The Empowerment Dynamic3 and How to Break Free of the Drama Triangle . I use the Stop, Breathe & Think app to help me focus during conflict situations, to check-in with/ or centre myself daily, and to reflect on codependency whenever it crops up. It consists of short mindfulness meditations (three to ten minutes) and is much healthier than stepping out for a cigarette, a rant in front of staff and patients or worse, repressing it. * I have not included examples of tweets. I see no reason to out anyone publicly on such a personal subject. In addition I do not think it is necessary either. Codependent No More: How to Stop Controlling Others and Start Caring for Yourself – Melody Beattie. Melody Beattie. http://melodybeattie.com/books/codependent-no-stop-controlling-others-start-caring/. Published 2018. Accessed April 21, 2018. Karpman Triangle. The official site of the Karpman triangle. https://www.karpmandramatriangle.com/. Published 2018. Accessed April 21, 2018. The Empowerment Dynamic. The Power of TED. http://powerofted.com/. Published 2018. Accessed April 21, 2018. Previous: Previous post: JC: One Too Many? Sounds like every Clinical Lead for Emergency Medicine. DOI: Clinical Lead for Emergency Medicine 2011-16 and (it appears) recovering codependent. Thank you for your feedback David. If we could only take care of ourselves the way we would like to take care of our patients, many of us will be in a much better place. Well this was a some what uncomfortable read. I recognise many (most) of those traits in myself. As a trainee, I would extend David’s observation right down the hierarchy of EM clinicians and our non Medical colleagues. I think the ‘codependent’ personality lends itself well to EM. No matter how hard you work, there is always more that can be done, something else that can be ‘fixed’. If you have the inability to disengage there will certainly always be something to draw you in. And ‘the service’ comes to rely on this and ultimately ‘going the extra mile’ becomes not that, but the norm. I will certainly be taking a look at Melody’s work on my back packing trip starting shortly. The first steps (literally) on the road to recovery! It was a dificult journey for me that eventually meant having to move on. Everyone’s journey is unique. Ignoring ourselves just means that reality will take a little longer to break through. And that moment will almost always be unpleasant at first. Melody uses Kubler-Ross’s grief process (denial, anger, bargaining, depression and acceptance) to describe this realisation. I think this post is really inspiring. The initial reviews were quite tricky really. Some people felt that this was too close to the mark for colleagues and that this degree of reflection and insight could be painful. I think that’s true, but that’s not a reason to shy away from talking about it. I suspect that we all have a degree of co-depency with our work, but social media has really opened up this to a much wider audience and it certainly amplifies the drama triangle behaviours. At St Emlyn’s we’ve always tried to be careful in what we tweet and discuss. In particular avoiding negativity in public. I think this post reinforces that behaviour and makes us ever more mindful of how we project ourselves personally and as an organisation to the wider world. Thank you Stevan for writing this and St. Emlyn’s for publishing it. It is a great piece of writing. I suspect that a poorly chosen word or a rogue comma could have adversely altered the tone of the entire piece. I think that owning the issue is important on a personal level but I wonder too about the importance of culture. In what ways does your department encourage and discourage codependency? I strongly feel that many of us chose our careers precisely because we are natural codependents. I think many of us will be able to trace the hallmarks of our codependency right back to childhood.